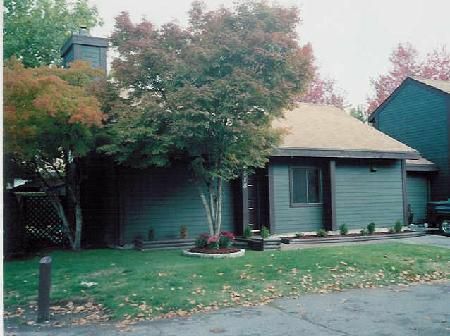 ABSOLUTELY GORGEOUS, TOTALLY REMODELLED END UNIT RANCHER TOWNHOME IN DESIRABLE GREENSIDE ESTATES must be seen. This meticulous home for families, investors or empty nestors boasts vaulted ceilings, laminate flooring, updated bath and tasteful decor. Entertainin is easy in the spacious living rm with vaulted ceiling, gorgeous laminate flooring and cozy gas fireplace with black marble hearth. Patio door to very private large wood deck which overlooks the yard. Dining rm boasts gorgeous laminate floors, vaulted ceiling and pass through to kitchen. efficient kitchen with white cabinets and small eating area. Storage rm off kitchen could dble as computer alcove. 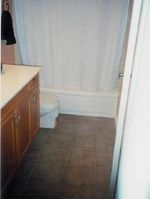 Attractive 4 pce bath with tile floors, new cabinet and counter top and laundry neatly tucked behind bifold doors. Both bedrooms have gorgeous laminate floors. Master is very spacious. Attractive end unit is absolutely gorgeous and is located in desirable Greenside which boasts tennis court, sport court, outdoor pool, exercise rm and recreation facility. The good life just keeps getting better with this fantastic opportunity.